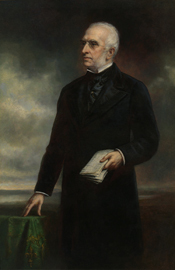 WINTHROP, Robert Charles, a Representative and a Senator from Massachusetts; born in Boston, Mass., May 12, 1809; graduated from Harvard University in 1828; studied law with Daniel Webster; admitted to the bar in 1831 and practiced in Boston; member, State house of representatives 1835-1840, and served as speaker 1838-1840; elected as a Whig to the Twenty-sixth Congress to fill the vacancy caused by the resignation of Abbott Lawrence; reelected to the Twenty-seventh Congress and served from November 9, 1840, to May 25, 1842, when he resigned; subsequently elected to the Twenty-seventh Congress to fill the vacancy caused by the resignation of his successor, Nathan Appleton; reelected to the Twenty-eighth and to the three succeeding Congresses and served from November 29, 1842, to July 30, 1850, when he again resigned to become Senator; Speaker of the House of Representatives during the Thirtieth Congress; appointed as a Whig to the United States Senate on July 27, 1850, to fill the vacancy caused by the resignation of Daniel Webster and served from July 30, 1850, to February 1, 1851, when a successor was elected; unsuccessful candidate for election to the vacancy in 1851; was an unsuccessful candidate for governor of Massachusetts the same year; presidential elector on the Whig ticket in 1852; engaged in literary, historical, and philanthropic pursuits; died in Boston, Mass., November 16, 1894; interment in Mount Auburn Cemetery, Cambridge, Middlesex County, Mass. Papers: Letters (1867-1881) from Peabody Education Fund general agent Barnas Sears in Curry family papers, 1816-1907. Papers: 1843-1885. 17 items. Invitations, acknowledgements, and an account of a trip to Baltimore. Papers: 1868, 1871, 1879, 1881. 4 letters. Papers: Correspondence in Sarah Fisher Ames papers, [ca. 1860-1879]; and 1 letter (August 20, 1857) to O. Tiffany. Papers: 2 letters (1849, 1871); 1 letter (October 10, 1870) in the Belmont family collection; 1 letter (July 14, 1873) in the Daveis collection; 1 letter (July 22, 1867) in the John Adams Dix collection; 2 letters (April 2, 1857; February 11, 1890) in the Hamilton Fish papers; 10 letters (1848-1891) in the Jay family collection. Finding aids. Papers: June 30, 1847. 1 petition. Signed by Winthrop and others, relating to acquisition by the federal government of a block of buildings adjacent to the Customs House in Boston. Papers: Correspondence in Henry Wadsworth Longfellow papers, 1811-1928; C.C. Felton papers, 1849-1862; Phillips Brooks papers, 1832-1900; and Palfrey family papers, 1713-1915. Papers: 1876-1892. 33 items. Concern various subjects. Papers: 1840-1887. 34 items. Additional items in Winthrop family papers, 1544-1963, on 53 reels of microfilm of originals in Massachusetts Historical Society; and correspondence in William Wilson Corcoran papers, 1791-1896. Finding aid. Papers: 11 boxes (1824-1894) in Winthrop family papers, 1544-1963, 28 feet, available on 53 microfilm reels; ca. 300 letters in the Edward Everett papers, 1675-1865; correspondence in Francis Cabot Lowell papers, 1799-1966; William Schouler papers, 1840-1872; and items in various collections. Finding aid. Papers: Correspondence in George Perry Morris papers, 1842-1918. Papers: 5 items (1852-1887); and 1 letter (July 31, 1846) to McClintock Young regarding a debt owed to Horatio Greenough in the Gilder Lehrman collection. Finding aid. Papers: 1 manuscript (1885) on the character of Washington; 1 letter (April 24, 1855) to W.B.Sprague; 1 letter (November 16, 1892) from Richard S. Storrs; and 1 letter (July 19, 1894) from Melville Weston Fuller. Papers: Correspondence concerning speaking engagement in Students' Lecture Association letters, 1854-1856. Papers: 1 letter (1872) in Elsa Noble collection, 1786-1912, of Hale family correspondence. Papers: 18 letters by and 7 to Winthrop (1849-1889) in various collections. Finding aid. Papers: Numerous items in various collections. Finding aid. Papers: Correspondence in Winthrop family papers, 1537-1904, on 53 microfilm reels of originals in Massachusetts Historical Society; in Fowler family papers, 1707-1870; Mailliard family papers, 1785-1927; Carrington family papers, 1749-1929; and Samuel Bowles papers, 1853-1890. Borome, Joseph, ed. "Two Letters of Robert Charles Winthrop." Mississippi Valley Historical Review 38 (September 1951): 289-96. Freiberg, Malcolm. "The Winthrops and Their Papers." Proceedings of the Massachusetts Historical Society 80 (1968): 55-70. Winthrop, Robert C. Addresses and Speeches on Various Occasions. Boston: Little, Brown & Co., 1852-1886. ___. Archimedes and Franklin. Boston: Press of T.R. Marvin, 1853. ___. Life and Letters of John Winthrop. 2 vols. 1864-1867. Reprint. New York: Da Capo Press, 1971. ___. Memoir of Henry Clay. Cambridge: J. Wilson & Son, 1880. Winthrop, Robert Charles [1834-1905]. A Memoir of Robert Charles Winthrop. Boston: Little, Brown & Co., 1897.